I’ve always found Acts 4 interesting for several reasons – not least the fact that the apostles were made to stand trial before the Sanhedrin, which reminds me of the times when Jesus was trialled in front of Caiaphas and company. In the case of Jesus, God allowed for their evil plot to run smoothly, but in the case of Peter and John, the Sanhedrin were clueless as to how they should deal with them. Acts 4:13, the verse that comes after this, is notable for pointing out a fact – When they saw the courage of Peter and John and realized that they were unschooled, ordinary men, they were astonished and they took note that these men had been with Jesus – these Pharisees who were so proud of their knowledge and their laws were thwarted by a couple of uneducated fellas. It is in the book of Acts that we see some of the most stirring speeches uttered by the apostles (or other disciples and followers of Christ), such as the longest speech recorded in the New Testament, Stephen’s pre-martyrdom speech that rebukes the Pharisees [Acts 7|Article on Acts 7:60]. Salvation is found in no one else – There are many powers, many authorities, many gods that are worshipped by various people, many idols of various kinds. But there is only one power that can grant us salvation, and that’s God. Paul said, For there is one God and one mediator between God and men, the man Christ Jesus, who gave himself as a ransom for all men—the testimony given in its proper time [1 Tim 2:5-6]. What is this salvation? It is clearly the salvation that John 3:16 so famously preaches – For God so loved the world that he gave his one and only Son, that whoever believes in him shall not perish but have eternal life. For God did not send his Son into the world to condemn the world, but to save the world through him [John 3:16-17]. What does this salvation entail? It is a salvation from pain, a salvation from oppression, a salvation from sin, and all that leads us to sinning. So if the Son sets you free, you will be free indeed [John 8:36]. 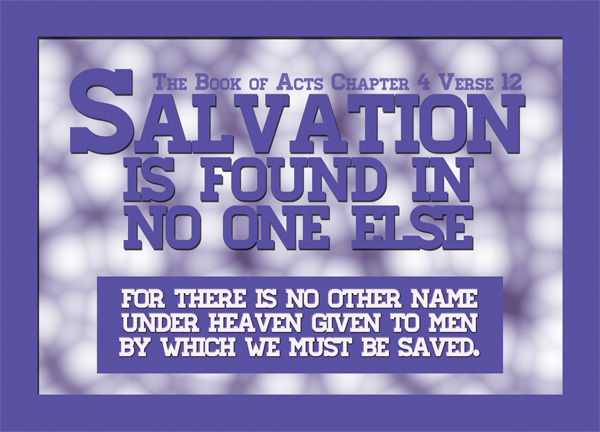 for there is no other name under heaven given to men by which we must be saved – Why can salvation be found in no one else? Simple – because there is only that one name that has the power to save, and that name is Jesus Christ. One of the Bible stories I loved as a child was Peter healing the crippled beggar, saying, “Silver or gold I do not have, but what I have I give you. In the name of Jesus Christ of Nazareth, walk.” [Acts 3:6] In the name of Jesus Christ, whose name has the power to save. I love that story because Peter somehow makes it a point to admit that he had neither gold or silver – how excellent! Jesus is our saving grace. We know that. But what of those who do not believe that? What of those who do not know that? What is their saving grace? Why do they work so hard in life for? Some may have a huge ambition. Some may slough so hard because of their family. I doubt it’s unfair to say that a decent number of people work so hard for money. Money is their saving grace. How sad is that, when there is only one true salvation of life, and that’s through Christ? Money may save their prides, save their jobs, even save their families or lives – but even as money may save them their lives, it is but temporary. In Christ, we gain the salvation of life by gaining eternal life. It’s a vastly different concept to extending one’s earthly life. It’s even sadder that this salvation, this one true saving grace is freely given to men. We just need to turn to God and ask for it. We just need to believe and have faith in it. This speech also served as an opportunity to preach and to reach out to some of those who are yet to follow Christ. When the apostles said salvation is found in no one else, the Pharisees had no counter. They could only look at Peter and John in shock and take note that they had been with Jesus – an extraordinary man whom they hated, because his words often make so much sense that they often had no counter against him. They were becoming more like Christ, even in their preaching. This was not lost on the old foes of Christ, the Pharisees who had regularly pitted themselves against Jesus would observe that better. Salvation is found in no one else, hence it makes no sense for us to worship or be obsessed with any other power or authority. Even money. Remember the 10 Commandments? – you shall have no other gods before me [Exo 20:3]. It’s pretty much the same logic. One of my greatest burdens is that the Cross of Christ is rarely explained. It is not enough to say that “He died” – for all men die. It is not enough to say that “He died a noble death” – for martyrs do the same. We must understand that we have not fully proclaimed the death of Christ with saving power until we have cleared away the confusion that surrounds it and expounded its true meaning to our hearers – He died bearing the transgressions of His people and suffering the divine penalty for their sins: He was forsaken of God and crushed under the wrath of God in their place. In light of what we know about the impeccable nature of the Son of God and His perfect fellowship with the Father, it is difficult to comprehend Christ’s words, yet in them, the meaning of the Cross is laid bare, and we find the reason for which Christ died. The fact that His words are also recorded in the original Hebrew tongue tells us something of their great importance. The author did not want us to misunderstand or to miss a thing! In Christ’s day, the Hebrew Scriptures were not laid out in numbered chapters and verses as they are today. Therefore, when a rabbi sought to direct his hearers to a certain Psalm or portion of Scripture, he would do so by reciting the first lines of the text. In this cry from the Cross, Jesus directs us to Psalm 22 and reveals to us something of the character and purpose of His sufferings. In the first and second verses, we hear the Messiah’s complaint – He considers Himself forsaken of God. Mark uses the Greek word egkataleípo, which means to forsake, abandon, or desert. The Psalmist uses the Hebrew word azab, which means to leave, loose, or forsake. In both cases, the intention is clear. The Messiah Himself is aware that God has forsaken Him and turned a deaf ear to His cry. This is not a symbolic or poetic forsakenness. It is real! If ever a creature felt the forsakenness of God, it was the Son of God on the cross of Calvary! The apparent contradiction is clear. There had never been one instance in the history of God’s covenant people that a righteous man cried out to God and was not delivered. However, now the sinless Messiah hangs on a tree utterly forsaken. What could be the reason for God’s withdrawal? Why did He turn away from His only begotten Son? Woven into the Messiah’s complaint is found the answer to these disturbing questions. In verse three, He makes the unwavering declaration that God is holy, and then in verse six, He admits the unspeakable – He had become a worm and was no longer a man. Why would the Messiah direct such demeaning and derogatory language toward Himself? Did He see Himself as a worm because He had become “a reproach of men and despised by the people” or was there a greater and more awful reason for His self-deprecation? After all, He did not cry out, “My God, my God, why have the people forsaken me,” but rather He endeavored to know why God had done so!The answer can be found in one bitter truth alone – the Lord had caused the iniquity of us all to fall on Him, and like a worm, He was forsaken and crushed in our stead. This dark metaphor of the dying Messiah is not alone in Scripture. There are others that take us even deeper into the heart of the Cross and lay open for us what “He must suffer” in order to win the redemption of His people. If we shutter at the words of the Psalmist, we will be further taken back to hear of the thriceholy Son of God becoming the serpent lifted up in the wilderness,and then, the sin bearing scapegoat left to die alone. The second metaphor is found in the priestly book of Leviticus. Since it was impossible for one single offering to fully typify or illustrate the Messiah’s atoning death, an offering involving two sacrificial goats was put before the people. The first goat was slain as a sin offering before the Lord, and its blood was sprinkled on and in front of the Mercy Seat behind the veil in the Holy of Holies. It typified Christ who shed His blood on the Cross to make atonement for the sins of His people. The second goat was presented before the Lord as the scapegoat. Upon the head of this animal, the High Priest laid “both of his hands and confessed over it all the iniquities of the sons of Israel and all their transgressions in regard to all their sins.” The scapegoat was then sent away into the wilderness bearing on itself all the iniquities of the people into a solitary land. There, it would wander alone, forsaken of God and cut off from His people. It typified Christ who “bore our sins in His body on the cross,” and suffered and died alone “outside the camp.” What was only symbolic in the Law became an excruciating reality for the Messiah. Is it not astounding that a worm, a venomous serpent, and goat should be put forth as types of Christ? To identify the Son of God with such “loathsome” things would be blasphemous had it not come from Old Testament saints “moved by the Holy Spirit,”21 and then confirmed by the authors of the New Testament who go even further in their dark depictions. Under the inspiration of the same Spirit, they are bold enough to say that He who knew no sin, was “made sin,” and He, who was the beloved of the Father, “became a curse” before Him. We have heard these truths before, but have we ever considered them enough to be broken by them? On the Cross, the One declared “holy, holy, holy” by the Seraphim choir, was “made” to be sin. The journey into the meaning of this phrase seems almost too dangerous to take. We balk even at the first step. What does it mean that He, in whom “all the fullness of Deity dwells in bodily form,” was “made sin?” We must not explain the truth away in an attempt to protect the reputation of the Son of God, and yet, we must be careful not to speak terrible things against His impeccable and immutable character. The believer is not the “righteousness of God” because of some perfecting or purifying work upon his character that makes him like God and without sin, but rather as a result of imputation by which he is considered righteous before God through the work of Christ on his behalf. In the same way, Christ was not made sin by having His character marred or soiled, thus actually becoming depraved, but as a result of imputation by which He was considered guilty before the judgment seat of God on our behalf. This truth however, must not cause us to think any less of Paul’s declaration that Christ was “made sin.” Although it was an imputed guilt, it was real guilt, bringing unspeakable anguish to His soul. He took our guilt as His own, stood in our place, and died forsaken of God. That Christ was “made sin,” is a truth as terrible as it is incomprehensible, and yet, just when we think that no darker words can be uttered against Him, the Apostle Paul lights a lamp and takes us further down into the abyss of Christ’s humiliation and forsakenness. We enter the deepest cavern to find the Son of God hanging from the Cross and bearing His most infamous title – the Accursed of God! The Scriptures declare that all humankind lay under the curse. As it is written, “Cursed is everyone who does not abide by all the things written in the Book of the Law, to perform them.” From heaven’s perspective, those who break God’s Law are vile and worthy of all loathing. They are a wretched lot, justly exposed to divine vengeance, and rightly devoted to eternal destruction. It is not an exaggeration to say that the last thing that the accursed sinner should and will hear when he takes his first step into hell is all of creation standing to its feet and applauding God because He has rid the earth of him. Such is the vileness of those who break God’s law, and such is the disdain of the holy towards the unholy. Yet, the Gospel teaches us that, “Christ redeemed us from the curse of the Law, having become a curse for us — for it is written, ‘Cursed is everyone who hangs on a tree.’” Christ became what we were in order to redeem us from what we deserved. He became a worm and no man, the serpent lifted up in the wilderness, the scapegoat driven outside the camp, the bearer of sin, and the One upon whom the curse of God did fall. It is for this reason the Father turned away from Him and all heaven hid its face. It is a great travesty that the true meaning of the Christ’s “cry from the cross” has often been lost in romantic cliché. It is not uncommon to hear a preacher declare that the Father turned away from His Son because He could no longer bear to witness the suffering inflicted upon Him by the hands of wicked men. Such interpretations are a complete distortion of the text and of what actually transpired on the Cross. The Father did not turn away from His Son because He lacked the fortitude to witness His sufferings, but because “He made Him who knew no sin to be sin on our behalf, so that we might become the righteousness of God in Him.” He laid our sins upon Him and turned away, for His eyes are too pure to ap- prove evil and cannot look upon wickedness with favor. To obtain the salvation of His people, Christ not only suffered the terrifying abandonment of God, but He drank down the bitter cup of God’s wrath and died a bloody death in the place of His people. Only then could divine justice be satisfied, the wrath of God be appeased, and reconciliation be made possible. In the garden, Christ prayed three times for “the cup” to be removed from Him, but each time His will gave into that of His Father. We must ask ourselves, what was in the cup that caused Him to pray so fervently? What did it contain that caused Him such anguish that His sweat was mingled with blood? It is often said that the cup represented the cruel Roman cross and the physical torture that awaited Him; that Christ foresaw the cat of nine tails coming down across His back, the crown of thorns piercing His brow, and the primitive nails driven through His hands and feet. Yet those who see these things as the source of His anguish do not understand the Cross, nor what happened there. Although the tortures heaped upon Him by the hands of men were all part of God’s redemptive plan, there was something much more ominous that evoked the Messiah’s cry for deliverance. In the first centuries of the primitive church, thousands of Christians died on crosses. It is said that Nero crucified them upside down, covered them with tar, and set them aflame to provide street lights for the city of Rome. Throughout the ages since then, a countless stream ofChristians have been led off to the most unspeakable tortures, and yet it is the testimony of friend and foe alike that many of them went to their death with great boldness. Are we to believe that the followers of the Messiah met such cruel physical death with joy unspeakable, while the Captain of their Salvation cowered in a garden, feigning the same torture? Did the Christ of God fear whips and thorns, crosses and spears, or did the cup represent a terror infinitely beyond the greatest cruelty of men? righteous life for the glory of God and in the stead of His people. Then in the appointed time, He would be crucified by the hands of wicked men, and on that Cross, He would bear His people’s guilt, and suffer the wrath of God against them. The perfect Son of God and a true Son of Adam together in one glorious person would take the bitter cup of wrath from the very hand of God and drink it down to the dregs. He would drink until “it was finished” and the justice of God was fully satisfied. The divine wrath that should have been ours would be exhausted upon the Son, and by Him, it would be extinguished. Imagine an immense dam that is filled to the brim and straining against the weight behind it. All at once, the protective wall is pulled away and the massive destructive power of the deluge is unleashed. As certain destruction races toward a small village in the nearby valley, the ground suddenly opens up before it and drinks down that which would have carried it away. In similar fashion, the judgment of God was rightly racing toward every man. Escape could not be found on the highest hill or in the deepest abyss. The fleetest of foot could not outrun it, nor could the strongest swimmer endure its torrents. The dam was breached and nothing could repair its ruin. But when every human hope was exhausted, at the appointed time, the Son of God interposed. He stood between divine justice and His people. He drank down the wrath that they themselves had kindled and the punishment they deserved. When He died, not one drop of the former deluge remained. He drank it all! wheat had fallen to the ground and died, it would have abided alone without a people or a bride. The pleasure was not found in the suffering, but in all that such suffering would accomplish: God would be revealed in a glory yet unknown to men or angels, and a people would be brought into unhindered fellowship with their God.